As part of the funeral service, many people will choose a casket or urn and perhaps a burial vault or other outer burial container. 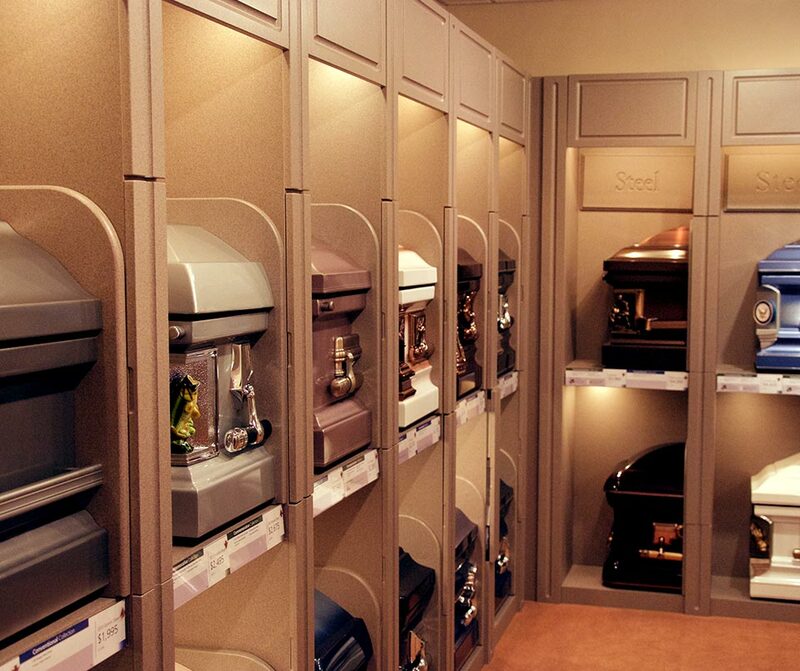 Your funeral director will guide you through these choices in our newly remodeled casket selection room. The caskets and urns can be tastefully personalized to acknowledge one’s hobbies/interest, faith, and/or service whether through military or as a first responder. Caskets available from the Dietrich-Mothershead Funeral Home are displayed in a well lit Casket Selection Room designed by Batesville Casket Company. Batesville Casket Company is an innovative leader in funeral service products. Their caskets are made in America with special attention paid to detail. In selecting a casket your loved one’s personality can be reflected in the details. A number of options can influence your casket decision. The type of material, design elements, and personalized features are key considerations. The thirty caskets we display provide a range of styles in both metal and wood. The caskets are displayed in three distinct casket collections. Conventional Collection – Within the Conventional Collection you will find caskets made of both steel and wood. These caskets feature traditional styling with simple lines and detail. The casket can be personalized with a Commemorative Tribute Panel. The tribute panel is located in the lid of the burial casket and provide a personal way to highlight a loved one’s interests, hobbies, faith or values. Commemorative panels are available in a wide variety of designs, including spiritual symbols, organizational emblems, favorite pastimes and special relationships. Commemorative Collection – Within the Commemorative Collection, you can choose from a wide assortment of tribute options to celebrate meaningful aspects of your loved ones life. The Tribute options may be applied directly to the casket-on the corners and/or interior panel- and are removable after the service, providing lasting keepsakes for the family and friends. The tribute options depict one’s spirituality, affiliations, hobbies and interests, and relationships. The Commemorative Collection provides touching ways to tell the story by providing personal tribute options that can be added to the casket at no additional cost. Classic Collection – Within the Classic Collection you will see caskets featuring classic elegance with exceptional finishes and interiors. Within the Classic Collection you will find caskets of premium materials and made of the finest craftsmanship. Casket costs vary widely. Caskets are available for less than $1000.00 while those made with premium material and hand craftsmanship may cost tens of thousands of dollars. There is a wide range of options in all price ranges for a proper tribute within one’s budget. Your funeral director will show you a price list of all the caskets available. Why are caskets so expensive? One of the main factors in determining the cost of the casket in the material that it is made of. Caskets made of copper or bronze tend to be more expensive that those made of steel. The thickness or gauge of the steel also is a factor in the cost. Using the same logic wood caskets made of mahogany or walnut tend to be more expensive than those made of poplar or veneered wood. The lining or interior of the casket also has an affect on the cost as does the amount of ornamentation. The level of craftsmanship and attention to detail also have a role in determining the final cost of the casket. Do I have to have a casket for cremation? Some may choose cremation as a method of final disposition but prefer a public service or private viewing before the cremation takes place. In our casket selection room there are three cremation caskets as well as a ceremonial casket for those who would choose this option. This allows for a visitation and/or viewing and even a service in our chapel, a church, or other location prior to cremation. The use of a casket for a simple cremation is optional. You will be required to purchase an outer container for safe handling of remains prior to cremation.